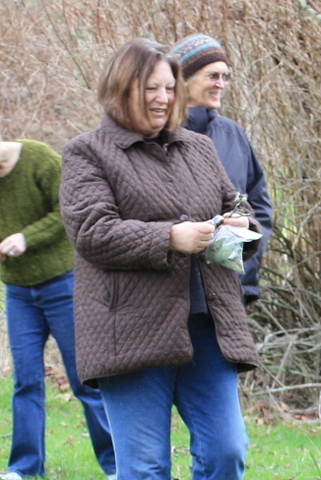 Judith collecting lichens for the dyepot. Orcas Island, Feb 2012. The effort to help Judith MacKenzie rebuild her studio following the fire in Forks, WA, is well underway. I delayed posting this until I had plenty of info. I have met two of the three wonderful people who have created this website and they (all three) are an important part of Judith’s network in the northwest. As many of you know, Judith is not one to ask for help, but she does know about this relief effort and the organizers are working with her to determine her needs. It was a horrible fire—I am so thankful we are talking about replacing looms and no lives were lost. Judith has been a tremendous force in my life and I am happy to have a way to help in the rebuilding of her textile studio. Visit Rebuild Judith’s Studio to make a donation, add an item to the online auction, or leave a note for Judith.